Monrovia – The Right Reverend, Bishop Mai Roberts of the Faith Healing Temple Church of Jesus Christ, has died. Bishop Roberts, who went to be with the Lord Jesus Christ early Monday, January 28, died at 97. According to family sources, funeral arrangements will be announced later. Born Mai Barclay to a humble mother, Sarah Reeves and a former Associate Justice of the Supreme Court, Anthony Barclay, Sr.— her father was the son of former President Arthur Barclay. 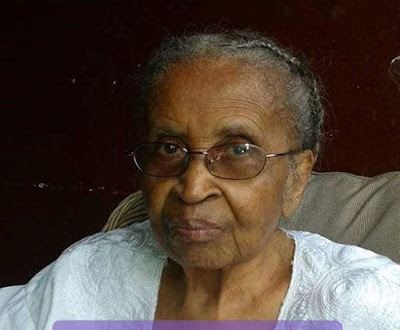 She joined the Faith Healing Temple in 1971 as a minister under its founder, the legendary Wilhelmina Bryant Dukuly. She took over as head pastor of Faith Healing Temple following the demise of Dukuly in 1990 amid huge doubts over whether she could ably fit in the shoes of the outspoken founder. She did and resoundingly too. During the 1990 crisis, Mother Roberts refused to depart the country despite having the opportunity to do so. Turning the Faith Healing Temple into a sanctuary, she accommodated a host of internally displaced people who had fled their homes from the carnage of the crisis. “One of the most remarkable things that she did was that she chose to remain in Liberia during the civil war, leaving her Congo Town home for the church on Bushrod Island,” recalled her son Rev. Charles B. Roberts also a minister of the Faith Healing Temple. “She risked her life because she received a message from the Lord that she should remain and stay with her flocks. She made a sacrifice for the distressed,” Rev. Roberts said of his mother. Between 1991 and her retirement in few years back, she in deed stepped in the footsteps of Mother Dukuly. Keeping with the church’s radio broadcast tradition, Mother Bishop Roberts trailed listeners with a soft-spoken voice of evangelistic Christian doctrine. The radio broadcast, which had been familiar with the church from its founding, took to a new height. “‘This is the day that the Lord hath made, we will rejoice and be glad in it,’” she would begin every broadcast sermon aired twice weekly. Mother Roberts was ordained bishop of Faith Healing Temple in 2006 by members of the Metropolitan Spiritual Churches of Christ, a sister congregation to the Faith Healing Temple. “She’s been an excellent mother, not only for her own children but also many people. If I would have to capture it in one phrase I would say she has exemplified the love of God. She is my mother I see her first as my mother. She has been a wonderful mother.